Capable of Shredding 6,000 Lbs of Paper/Hr. Whether you’re looking to clean out a few boxes of paper in your garage or need to purge several pallets’ worth of records from storage, you can count on Shred Wise. 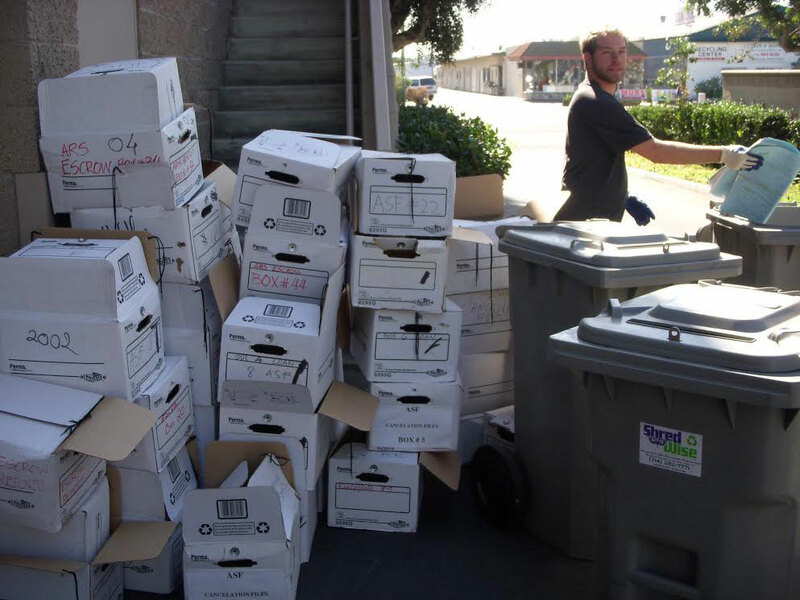 We have the capacity and expertise to properly shred and dispose of any volume of sensitive documents at a cost-effective price anywhere in the Orange County area. Over the last eight years, we have served the document destruction needs of thousands of commercial and residential clients, and helped them comply with today’s strict privacy law regulations. At Shred Wise, we are readily available to accommodate scheduled purges as well as last-minute requests for same-day or next-day shredding service. In every scenario, we will apply the industry’s best practices for document destruction, as recommended by NAID, the National Association for Information Destruction. For one-time purges, we’ll typically dispatch one of our state-of-the-art mobile shred trucks. Our shred trucks are highly secure and efficient. They feature a hood over the shredder to prevent unauthorized access, an automatic arm for hands-free emptying of shred bins into the shredder, and an hydraulic compactor that effectively helps to dilute every load of paper we shred. These trucks have the ability to shred more than 6,000 pounds of paper an hour and are equipped with an onboard shred cam so you can watch your documents get shredded. Alternatively, our Orange County clients can request off-site shredding for large purging jobs, where we send out a lockable panel truck to pick up all your paper, file boxes, and/or shred bins. We then transport the paper to our facility in Orange where we proceed with shredding your documents using our same mobile shred trucks and secure procedures. With our all of our mobile shredding services, Shred Wise guarantees 100% paper destruction and recycling. Additionally, we keep our rates highly competitive and provide exceptionally responsive and reliable customer service. We are licensed, bonded, and insured. Call today for the best value in as-needed/one-time paper shredding services in Orange County. Estimates are free. Great company. I gave Sherry a call to set an appointment for them to come out and shred 4 pallets of past receipts. Gary (Sherry's husband) was out the very next day. Within just about an hour and a half all of my shredding had been done on site. Great customer service and best of all it cost a lot less then expected. For the latest News and Events follow us on Facebook! If you don't see your city listed, please give us a call.